„Mega Joker™“ serves you a delicious fruit cocktail of strawberries, melons, plums, grapes, cherries, pears, oranges and lemons. 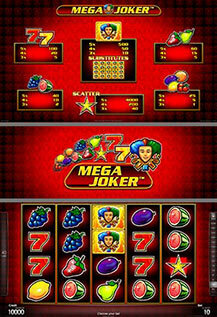 Try this mix of local and exotic fruits and win top prizes with the „Mega Joker Special bonus“. „Mega Joker™“ offers 5 reels and 40 lines. All prizes are for combinations from left to right and are on selected lines, except Scatter (STAR symbol). Scatter symbols pay at any position. Scatter wins are added to line wins. JOKER replaces all symbols except Scatter. JOKER symbols in combination with fruit symbols trigger "Special bonuses".